There are plenty of online travel sites these days, and you can book just about anything with just a few clicks. But is the Internet really the best way to book your vacation? As they say, you get what you pay for. If you’re not sure a travel agent is right for you, here are 5 reasons they can help you plan your perfect vacation. Do you think working with a travel agent means you’ll lose control of your trip? Not so. In fact, agents prefer to collaborate with travelers in planning their vacations. Together, you’ll decide the right level of involvement, which may vary from trip to trip. You may be more familiar with the area and are happy to do most of the planning yourself, but you want to access to better amenities by booking through your agent. Or you may want to hand over your trip preferences and let your agent craft a complete itinerary for you. No matter the level of involvement, you’ll walk away with a whole itinerary that’s personalized to YOUR wants and needs. Searching for the best deals online? You may find some, but what you may not know is travel agents have the inside scoop on the best deals around. What you pay in planning fees you save on great rates your agent passes on to you – such as special flight or hotel prices. Beyond saving money, you’ll get more bang for your buck. Travel agents have buying power in the form of better amenities or VIP upgrades for their clients. These small things can easily heighten your vacation experience and make it more memorable. Knowing your travel agent is there for you 24/7 during your trip will give you the peace of mind you need to fully enjoy every moment. If your flight suddenly changes at 9 p.m. and you’re due to fly out early the next morning, your agent will ensure it’s handled. All you’ll have to do is head to the airport and check in for the new flight time, instead of waiting in line with everyone else. What’s more, unforeseen changes can impact other travel arrangements, such as your hotel stay. Should your new flight time mean you’ll be spending one less day at the hotel, your agents will reach out and let them know there’s been a delay. Having immediate assistance at your disposal is priceless. As travel agents venture out on their own explorations, they also build professional contacts with local suppliers in the countries they visit. Having an on-site contact to reach out to when traveling internationally will help make your trip safer. Oftentimes, your agent will have a local phone number you can use in case of emergency. This is ideal to have should you ever need immediate assistance. Your travel agent may be a preferred partner with companies like Virtuoso and Four Seasons, which opens the doors to higher-end amenities and accommodations. You may be able to get upgrades not available through online booking sites, like having dinner on the beach or eating a five-course meal at the best restaurant instead of getting a food and beverage credit. This goes for special requests as well. Say you go to Croatia and you want to go on a special excursion that’s not open to the public. Or perhaps you’re in France, and you need a last-minute salon appointment before heading out for the evening. Your agent may have built a relationship with a supplier who can make it happen. Such niceties can create a more sophisticated and luxurious vacation experience for you. 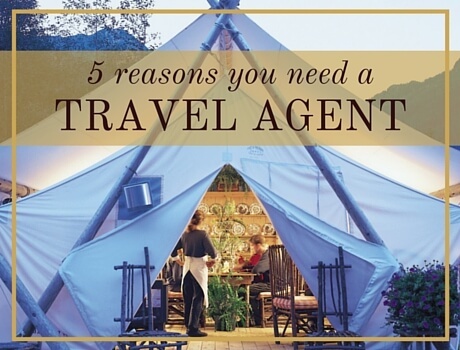 Have you ever booked your vacation through a travel agent? Tell us what your experience was like in the comments.